This could be a long write-up as it was a truly momentous day. The southern chapter of this “club” made up of Irish Pete, Chewy and Young Will (that’s me…don’t ask) made the train journey from King’s Cross to Ilkley to meet up with the Northern Chapter – Nobby, Mr G and Ronaldo Mortino. Having dropped a bag in our rooms we convened in the Brasserie of the Devonshire Arms Hotel (recommended) for a light Burgundy luncheon. Most of the wines through the whole day were served blind or partially so. The white we started with was Bourgogne Blanc 2006 from de Vogue, which by coincidence we had discussed a little on the way up. It is the wine made entirely from the Musigny Blanc Grand Cru site that, due to replanting, has been released as Bourgogne Blanc since 1994. I find it has a unique, oily texture, this was rich, with lime-like acidity and much more to give in coming years. A pair of reds followed and couldn’t really have been much more different even if appellation and quality of the vintages might suggest otherwise. First was Vosnee-Romanee 1er Cru “Aux Reignots” 2002 from Sylvain Cathiard which I was delighted about for a few reasons, amongst them the fact that I have heard such great things but also that it is the first Cathiard wine I have drunk. There was a lovely combination of red/black fruit and mulled wine spices but with a precise freshness too, really lovely and whilst it is still a “puppy” it is very enjoyable. The later was Vosnee-Romanee 1er Cru “Beaumonts” 1999, Dominique Laurent – precision and freshness are two words you couldn’t really use here. Famed for use of 200% new oak I am not sure what Monsieur Laurent used here but it over powers the fruit and leaves it dry and “exposed”. There is no real length and the fruit is stewed. The bottle remained a third full, not because it was actually awful but because there was no charm or fun to be had..a strange wine. 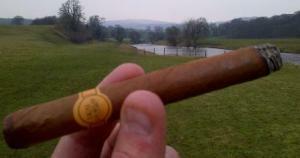 Having eaten well and rested from the journey it was now time for a walk up to Bolton Abbey and a quick cigar for a couple of us – a Quai d’Orsay Corona – a lovely elegant day time smoke that worked well. After a quick 15 minute break for the dreaded blackberry we re-assembled for a brief comparative tasting. 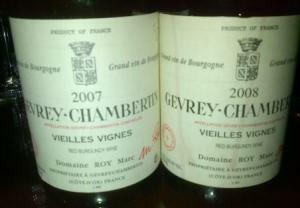 The two wines in question being both 2007 and 2008 Gevrey-Chambertin Vielles Vignes from Domaine Roy Marc. This was a nice tasting. The 2008 was the star, an underrated or “insiders” vintage with the 2009 and 2010 over shadowing it. The 2007 was also good but lacked a little of the focus and red fruited character that you expect of 2007, it might just be in a little bit of a phase. A brief break and then it was pre-dinner Champagne time with a Krug 1995 Magnum, this was rich and very yeasty/biscuity, I would have put it down as being at least 1988 or older such was the intensity. Had we had this with food it would have been a little more balanced I feel but it was most certainly a decadent start to an amazing evening. We then headed off down the road to the Boxtree in Ilkley. I will not dwell on the food much but we were very very well looked after in terms of both service and the food itself so many thanks to Andrew, Didier and the team there. Next on the agenda was the first of 5 blind white wines. Wehlener Sonnenuhr Auslese (Long GoldKap) 1995 from Prum, this was a confusing one as it had a relatively lower acidity, I was a decade or so out and actually went for Rheingau. It was soft and beautifully rounded a great drink and nice now. From there we were seated and served a Piesporter Goldtropfahen “Feinste” Auslese 1959, Bischofliches Konvikt (J.Harvey and Sons, Fuher 9403) clearly not a wine anyone was going to get spot on!! I guessed Spatlese 1976 but confused the age with a lower ripeness. 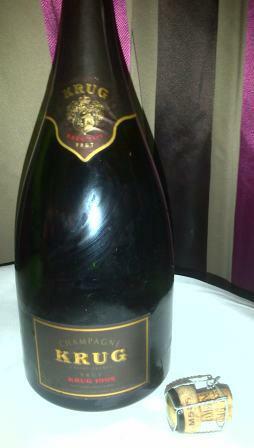 It was lovely, refined with a classy richness. Now it was white Burgundy time and first was a bottle that was a late addition from one of our hosts, thankfully so as it was delicious. Meursault 1993, Coche-Dury was the wine and the guesses were all Premier and Grand Cru and from more exalted vintages. There was that wonderful Coche character of a struck match and slight edge of reduction. Coche almost never disappoints, there was fruit, structure and a lovely texture to this, for it’s “humble” status it was staggering. The last two whites were served as a pair. 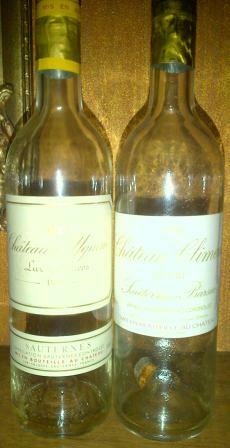 Both were Grand Cru 1992’s from Neillon, first Batard-Montrachet and then Chevalier-Montrachet. The character you think of with these two Grand Cru showed perfectly. The Batard a little more extrovert and a little more initially expressive it has shoulders and a more sturdy feel. The Chevalier a dash more refined and a little less showy. The two wines got better and better in glass and opened out. These were very impressive. 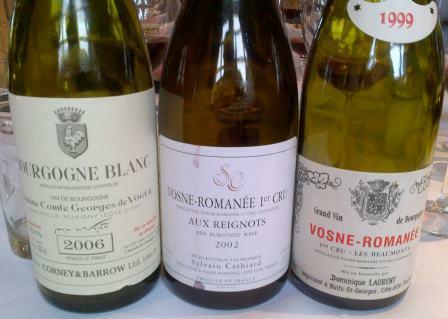 The 1992 whites remaining slightly under praised those I have been lucky enough to drink have been spectacular. The wines so far were more than you would dare hope for on even a special wine night but amazingly they were really setting the scene for what was to follow. 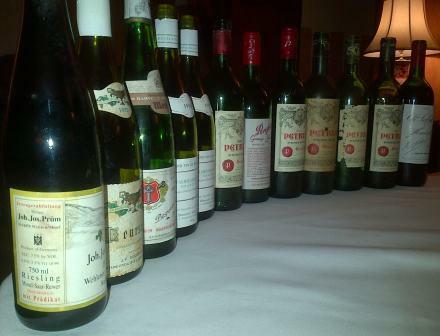 A Petrus bonanza of sublime proportions. As a warm up to this evening I had read the chapter in Neal Martin’s book “Pomerol” on Petrus and I have to say it is a great read, the style works well and gives you information and an understanding without being too intense, recommended. Prior to this evening I had been lucky enough to have tasted 2010 at the En Primeur stage and drunk the 1998, 1990 and 1979 at generously thrown dinners or lunches. On this evening we had 5 vintages with one “imposter” thrown in. The first flight was Petrus 2001, Penfolds Grange 1982 and Petrus 1982. The 2001 was by a long way the youngest tasting 12 year old wine I have ever had. Having to put a vintage on it was very difficult for a few reasons. I knew that the vintage we would be having were all very good ones and I knew there would not be anything overly “young”. This left me with a real dilemma as both the intensity and purity fruit were making me think of a very young wine, almost barrel sample young. I plumbed for 2003 thinking about the intensity angle. The 2001 is the year my son was born and so a vintage I have an attachment too it is also generally stunning for, especially, Pomerol. This is a generally magnificent wine, simply brilliant. The Grange was next and whilst the character was very different the texture and class was apparent. Blind I can’t remember what we all went for but in retrospect (as always) there was a slight eucalyptus nose with the dark fruit. If you own Grange 1982 you can be very happy. So a legend was next and I am delighted to say that having not excelled on the blind front so far (Irish Pete and Chewy having done better) I nailed this one. Why? well mainly because this was exactly how I imaged (hoped) it would be, the 1982 had expressive and “easy” extrovert fruit combining with the high-toned Petrus liveliness. A simply great wine, so much there and so complex but at the same time so easy to enjoy…a special moment to try a special wine. 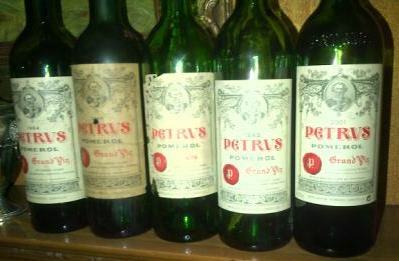 The next trio was Petrus 1975, Petrus 1967 and Petrus 1964. I was passed making many notes by now and just enjoying the wines. The 1975 is my birth year and to have this hot on the heels of the 1982 was wonderful. There wasn’t the expressive exuberance of the 1982 here or in the rest of the flight as these wines were in the next stage of development. Having said that there is a very definite Petrus character, very much a character and not a style. You get no sense of wines that are “made” just fruit from a great site expressing itself. The 1975 had great balance, a drier type of fruit to the 1982. My notes simply say “very good!”. The 1967 and 1964 were both in good condition holding a strong colour. The 1967 had a dark fruit character but with a savoury development as you would expect. The 1964 had a very complete feel and texture with a saline edge to the palate that I liked. It had been a simply amazing two flights of Petrus. The 2001 impressive for its youth and purity, the 1982 for its expression and completeness then the 1975, 1967 and 1964 for their array of more developed and savoury complexities. I will certainly never have all of those again in 0ne sitting. Drinking great wines with great friends is what it is all about in my book and this was exactly how this wonderful day went…it does make the return “fixture” more than a little daunting.